Plug into all the utilities you need. The major utilities, including SA Power Networks, Envestra, Telstra and SA Water, have services located within, or in close proximity to, the airport. These utilities are able to service the current and future developments described in this Master Plan to cater for equitable service delivery to businesses on-airport. As a result, there a number of easements contained within the airport site that must be taken into consideration when contemplating the development of new structures. 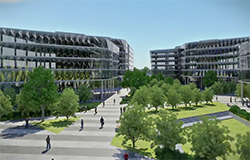 Before any building works can commence they must be approved by both Adelaide Airport Limited (AAL) and the Airport Building Controller (ABC) prior to the commencement.